Shares of Manchester-based Revolution Bars Group plc fell almost 20% on Monday after it said it expects adjusted EBITDA for its full year to fall to around £12 million from £15 million in the previous year. Revolution Bars CEO Rob Pitcher said: “The uplift in like-for-like sales performance over the festive period gives us momentum going into the second half and I’m pleased with the progress being made in refreshing the Revolution brand proposition. The news came in a trading update for the 26 weeks to December 29, 2018, and for the important Christmas and New Year trading period. “Total revenue for the 26 weeks ended 29 December 2018 was £78.5m (H1 FY18: £73.8m), an increase of 6.4%,” said Revolution Bars. 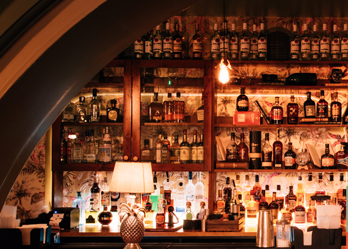 “Five new venues opened during this period: Revolution Mitchell Street in Glasgow and Revolucion de Cuba Southampton in August, Revolucion de Cuba Bristol in October, and Revolucion de Cuba Huddersfield and Revolution Durham in November. “Overall, these venues have traded ahead of expectations. “Like-for-like sales in the important four week trading period leading up to and including New Year’s Eve were 2.6% higher than last year and 8.7% higher over two years. “This is the sixth consecutive year of growth over the festive period. “During this four week period, pre-booked party revenue was up 11.7% on a like-for-like basis and average weekly sales per venue were above £60,000 with 22 venues setting new total sales records. “As expected, and as reported by many high street retailers, Christmas trading came late with like-for-like sales in the last two weeks of the financial period up 8.1%. “Like-for-like sales performance for the 26 weeks ended 29 December 2018 was -4.0% below last year with the first quarter at -5.0% (as advised at the time of the group’s announcement of its annual results on 2 October 2018) and an improved second quarter at -3.1%. “Sales trends in October and November broadly followed those experienced in the first quarter but, as anticipated, stepped up significantly in December. “The 26 week reporting period does not include New Year’s Eve, consistent with the comparative period. “Revolucion de Cuba has continued to grow like-for-like sales during the 26 week period with a particularly strong performance over the Christmas period. “Whilst the Revolution brand has also achieved growth over the four week trading period to New Year’s Eve, it has consistently traded below last year over the 26 week period. “The board is well progressed with its work on revitalising the Revolution brand proposition and continues to implement the required changes to the customer offer with further initiatives being launched in the coming weeks. “The board expects to be able to provide an update on the Revolution brand proposition when it publishes interim results on Friday 1 March 2019. “The board expects adjusted EBITDA for H1 FY19 to be approximately £2.0m lower than last year due to the like-for-like sales decline and increased operating costs. “Whilst the business has seen a much improved trend over the Christmas period, there is still further work to be done on the Revolution brand and therefore the board is taking a cautious approach to trading in the second half given the economic and political uncertainties at this time.